Source Photo by Annie Leibovitz. Models pictured: Front Row Left to Right : Gail O’Neal, Karen Alexander, Shakara Ledard, Clara Benjamin, Naomi Campbell, Iman. Second Row Left to Right: Kadra, Kara Young, Cynthia Bailey, Tyra Banks, Liya Kebede, Beverly Johnson. In 2001 Vanity Fair celebrated 30 years of black beauty with a stunning collection of some of the most beautiful black models in the industry. The shoot included Naomi Campbell, Iman, Liya Kebede, Tyra Banks, Oluchi, Beverly Johnson and Noémie Lenoir, to name but a few, and there hasn’t been anything similar within the industry since Vogue Italia released their Black Issue back in 2008. Although we should show our appreciation of black models, one would have hoped that almost 12 years on that we shouldn’t need to have a special platform to showcase black models, there has been some development with models such as Jourdan Dunn, Chanel Iman, Sessilee Lopez gracing the international catwalks and magazine covers, however it was recently highlighted that whist we are familiar with the likes of Gisele Bundche and Russian model Natalia Vodianova, most were still unaware that the number 1 model in the world was actually Puerto Rican model Joan Smalls. In no particular order we thought we’d take a look at the models of African origin making an impact on the fashion industry today. Ethiopian model Liya is a renowned name on the modelling scene, Kebede’s career started when Tom Ford offered her an exclusive contract to model for Gucci’s 2000 AW collection and she has featured on the covers of Italian, Japanese, American, French and Spanish Vogue, and has worked with the likes of Yves Saint-Laurent, Victoria’s Secret, Emanuel Ungaro, Dolce & Gabbana, Escada and Louis Vuitton. In 2003, she made history by becoming the first ever black model to represent cosmetic company Estee Lauder. Originally from Zimbabwe, Nyasha is probably most recognised as the face of Louis Vuitton’s 2011 AW campaign, she has also worked for Burberry Prorsum, MaxMara, and featured in British Vogue. Face of Africa” competition, and has graced the cover of Vogue Italia. She has also worked with the likes of Christian Dior, Chanel, Giorgio Armani, Gucci, Victoria Secret and Duro Oluwu. 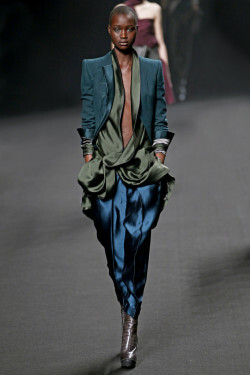 Kenyan model Ajuma Nasenyana has worked with the likes of Vivienne Westwood, Marc Jacobs, Issey Miyake and Fendi and Victoria Secret, and was named 2012 Africa Fashion Week Model of the Year. French model of Polish and Chad heritage, Anais has walked for the likes of Louis Vuitton, Marc Jacobs, Vera Wang, Caroline Herrera, Philip Lim, Victoria Secret and has featured in Vogue Italia, Vogue Paris (editorial) and Harpers Bazaar. 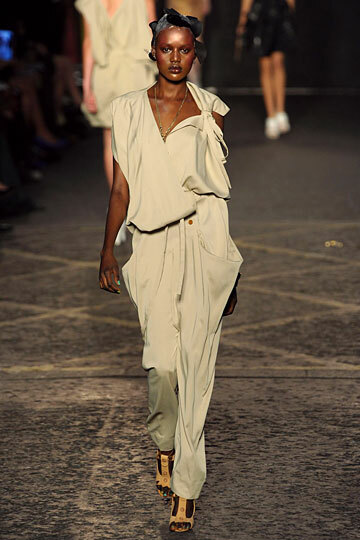 Australian model of Sudanese origin, Ajak has worked with Lanvin, Givenchy, Chloe, Marc by Marc Jacobs and Jean Paul Gaultier, Vivienne Westwood and Hermès and has featured in various editorials. Sudanese model Alek Wek is a veteran in the modelling world and has been gracing the catwalk since 1995, she has walked for various designers and featured in various editorials, and has the title of the first African model to appear on the cover of Elle magazine. Born in Burkina Faso Georgie Badiel has worked with Diane von Furstenburg, Marc Jacobs, Issey Miyake, Louis Vuitton, Oscar de la Renta, and Bottega Veneta to name but a few, and has also appeared in Russian Vogue editorial and Elle editorial. Sudanese born Ataui Deng clearly shares some amazing genes, she is the niece of veteran model Alek Wek, and has worked with Lanvin, Hermès, Christian Dior, and Vivienne Westwood to name but a few.